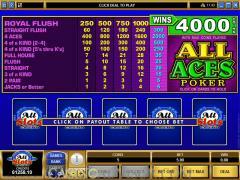 All Aces Poker is a video poker game produced by Microgaming, the world's foremost developer of online gambling software. Like many of the poker variations the company releases, this one has a theme, and a large part of it revolves around aces. Where the "all aces" part comes into play involves the fact that achieving four aces on the part of the player will bring a greater payoff than anything possible, with the exception of a Royal Flush. There are also comparatively high payouts for achieving Four of a Kind, and the exception to other forms of video poker is that getting Four of a Kind in 2's, 3's or 4's will being a higher payout than those of higher ranks (outside of the ace, of course). The game is played with a standard deck of cards, which means 52 cards and no Jokers. There are no wild cards in the game. The procedure is relatively simple. As the player, you will be dealt five cards, at which point you will hold the ones you want, and "Draw" (the control is in the lower right-hand corner of the interface). You receive cards in place of the ones you discarded, and are paid off accordingly. The pay table is right above the display of the cards, so there is no mystery as to what the payout on each winning hand is. When you look at that pay table, the payouts are rather proportionate according tot he coins that are played. For example, when you get a full house, you are paid 7 coins for a one coin wager, 14 for two coins, etc., up to 35 coins for five coins bets. 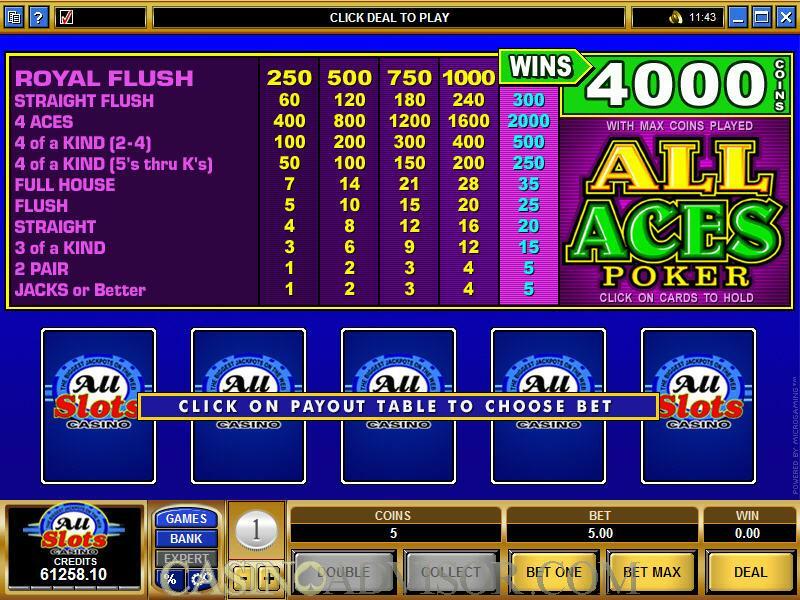 However, there is a major difference in the payout for a Royal Flush, which pays out 1000 coins on the basis of a four-coin wager and 4000 for five coins (the 4000 coins is the maximum payout in the game). You are able to track certain stats on this game, including a "win summary," which essentially details the type of winning hands you have achieved. However, there is no Expert mode, which means Autoplay is not available, and neither is a "hints" option, which would tell you when your play varies from that of an optimum mathematical strategy. Obviously, this is a poker game in which you are playing against the dealer (the house). And as part of that, you can turn on an option which allows you do "Double" as opposed to simply collecting, when you have a winning hand. In this procedure, the dealer will turn up a card, and there will be four face-down cards to the right of that card. You click on one of the cards, a la "Let's Make a Deal," and if that card has a higher value than the dealer's card, your win is doubled. Other game options include the ability to adjust sound settings as well as the speed of the game; in other words, you can play in "Slow" mode, as well as "Medium," "Fast" and "Fastest." It all depends, one supposes, on your ability to make decisions quickly and get more money out on to the table. 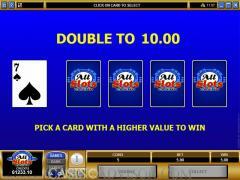 Interested in reading more detailed information about All Aces Video Poker? If so Click Here for more details. Copyright © 2019 CasinoAdvisor.com - All Rights Reserved.